Not to be confused with Florence Airport or Florence Municipal Airport. 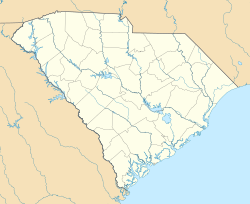 Florence Regional Airport (IATA: FLO, ICAO: KFLO, FAA LID: FLO) is a public airport three miles east of Florence, in Florence County, South Carolina. The only scheduled flights are American Eagle to Charlotte-Douglas International Airport, which takes about 30 minutes. Florence Regional Airport covers 1,436 acres (581 ha) and has two asphalt runways: 1/19 is 6,000 × 150 ft (1,829 × 46 m) and 9/27 is 6,502 × 150 ft (1,982 × 46 m). In 2006 the airport had 31,242 aircraft operations, average 85 per day: 77% general aviation, 16% air taxi and 7% military. 52 aircraft were then based at the airport: 73% single-engine, 25% multi-engine and 23% jet. The airport began with the purchase of 300 acres (120 ha) in 1928. During World War II, the United States Army Air Forces' Third Air Force used the airport as a training base and added 1,400 acres (570 ha). Known as Florence Army Airfield, the 52d Pursuit Group was assigned to the airfield on 18 February 1942 and trained with P-39 Airacobra and P-40 Warhawks until departing on 27 April for Wilmington, North Carolina. A succession of Troop Carrier groups trained at Florence during 1943 those being the 63d, 65th, 313th and 315th prior to their deployment to Europe and North Africa. Afterwards, the airfield became a combat crew replacement training school for A-20 Havoc light bomber crews, with the 411th Bombardment Group being the Operational Training Unit at Florence AAF from 15 August 1943 until 1 May 1944. After the 344th was inactivated, the replacement training was taken over by the 334th Army Air Forces Base Unit (Replacement Training Unit, Light Bombardment). Support units at Florence AAF were the 407th Base Headquarters and Air Base Squadron; 10th Aviation Squadron; 958th Guard Squadron; 341st Sub-Depot; HQ, 411th Bombardment Group (Light). Florence AAF controlled two auxiliary training bases for its A-20 Training. In early 1945 the airfield was transferred to First Air Force and the 127th Army Air Forces Base unit (Combat Crew Training Station, Light) assumed the A-26 Invader training mission. After the war, the property was given back to the City of Florence on 31 October 1945 and later shared with Florence County. Eastern Airlines operated at FLO from 1948 until 1965; Piedmont Airlines operated commercial flights (including Boeing 737s) until ending service in 1981. Operation of the airport was assigned to the Pee Dee Regional Airport Authority in 1999. The authority had nine representatives from the Pee Dee Regional Airport District, which includes the City of Florence, and the counties of Florence, Dillon and Marion. From the 1960s until 1997 Florence was home to a large aviation museum, the Florence Air & Missile Museum. When it closed, the collection was divided and transferred to other aviation museums in the United States. ^ "RITA | BTS | Transtats". Bureau of Transportation Statistics. January 2017. Retrieved 15 May 2017.